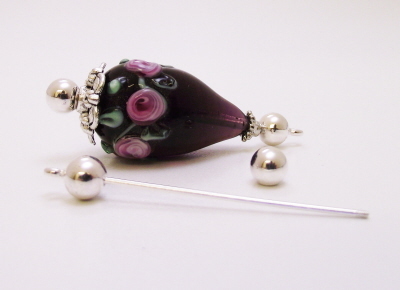 A fantastic , simply idea that works a treat with your lampwork beads. This is a silver plate rod with a 5mm silver ball top and bottom , the bottom silver ball unscrews to allow a bead to be threaded onto the rod to turn any bead into a hanging pendant . The top ball has a loop for threading onto a necklace .Total Length of rod is 35mm.